Designed by Daniel Brooks. Nine juggling objects are displayed on a “part tree,” inspired by plastic models. Each juggling product is numbered with a key of product names printed on the back. All shirts are 100% cotton. 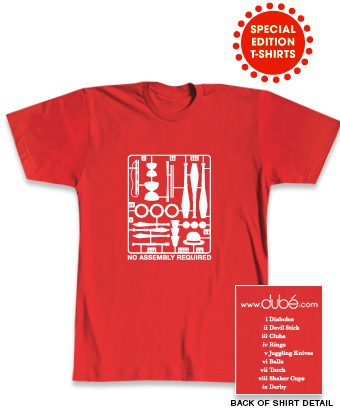 #2111 No Assembly Required T-Shirt $20.00 ea.